We stock a range of unique and robust Cat Scratching Posts, Climbers and Activity Centres designed to encourage your cat's natural scratching behaviour! All cats instinctively need to scratch something to mark their territory, clean, maintain and remove the sheaths of damaged, worn out claws, especially indoor cats who can not scratch a tree or fence in your garden, so it's essential to provide them with a suitable cat scratching post or activity centre to prevent them being destructive and taking their frustrations out on your expensive furnishings. Simply providing your cat or kitten with a cat activity centre or scratch post, will encourage them to climb and scratch the cat activity centre, rather than your wallpaper, carpet or furniture saving you money and heartache replacing damaged items. Our range of Cat Scratching Posts and Activity Centres use catnip, tough sisal and anti-scratch fabrics to encourage the natural behaviour of your cats and kittens, providing them with mental stimulation, exercise and a safe place to hide and sleep the hours away! Please look at the Cat Scratching Posts and Pads page on this website for more unique cat scratching posts & furniture, manufactured by Ancol, Canac and Rosewood. The Cat Activity Centres on this page have been developed to provide cats of all ages and abilities with endless opportunities to behave naturally, by providing platforms to climb, scratch and explore their surroundings, as well as hide aways and hammocks for sleeping! Activity Centres: 5 stars out of 5 based on 20 user reviews. Porsche, Bianca and Flossie love this activity centre, this one was bought to replace one which had been very well used! Fantastic customer service and super fast delivery, I will use your website again. Superfast delivery. Great price. Very happy with purchase. Our 3 cats love it! Will be back. Our cats have never stopped playing with this since it arrived - great product!!! Excellent service arrived very quickly and very reasonable prices. My cats are delighted. Would highly recommend. 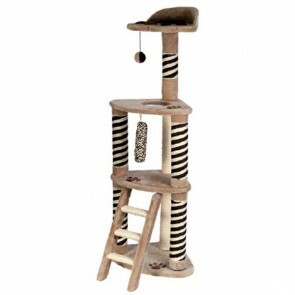 These climbers are fantastic value and great fun for the cats! They last for a long time and I always buy more than one because I couldn't imagine a time when the cats would be happy without one! Valupets are by far the best price for these climbers. My cats love this product, I have had several in the past, this was to replace a well used one. The delivery is second to none. Delivered the day after ordering, free delivery as well. This is an excellent web site and will use again. Despatched quickly and efficiently. The cat tree is easy to build and straightforward assembly instructions included. Robust for the price and good quality. My cat loves it! This is a great product at a great price. I bought this to replace one of the same model which was getting a bit worn after 6 years of scratching. It fits neatly into a corner allowing our cat to watch the birds from a window, and the double lengths of scratch pole allow her to scratch as far as she can reach. Fast delivery and prompt and polite information regarding goods ordered made using this store a good experience. Would definitely recommend it !